recording to the same partition as your pupsave file is stored. It also uses a new folder selector. Edit: Several recording events are possible simultaneously. that the set button is clicked. Clicking on 'Stop' kills the arecord app. in my P4 computer recording a MP3 file. This is much less than mhwaveedit. I find that it is stabler than mhwaveedit. recording is started and then when it is finished. A great way of checking to see if recording has begun. Click on animated GIF to see the sound input levels. record or if it is already recording it will stop the recording safely. when they use a GUI. Bacon Recorder should work in all versions of puppy linux. See picture in next post to get a better idea. An innovative feature is keeping a log of recordings. to make a bad recording. a countdown timer or a given time to start the recording. If anyone needs OGG then contact me. MP3 mono is very low quality but it's intended for speech. between words like 'MP3 Stereo' to work correctly!! Innovative new method of checking to see if partition is mounted. This is done at the launch of app. and the application restarts automatically. feature very useful and innovative. of 60 minutes , fill in 70 minutes if you wish. I tested with two different FET mikes and when I recorded with Mono mpr the result was very noisy. Maybe they are too cheap quality. Speed Link SL-8707 and a Head set Media Tech MT 363 or is it the mono mp3 itself that has a low signal noise difference. Everything drowns in the noise. I had the Mic booster on max maybe that made it noisy? But when setting the boost to lowest that only did shift the output level and not the noise noticeably My computer maybe has a poor microphone amp. But I failed to make a decent recording. Next night I will try with the other two settings or recording format them giving a higher quality. What levels on Mic and mic booster on recording do you use for recording normal talk some two feet away? 50 CentiMeters? Hope my questions are not too Off Topic. this one being easier to set up and working on more platforms. I will test it during my sleep now to see if it catches my breathing or sleep apnea when I stop breathing and how often that happens. 10 hours is how many minutes? 600? the sound won't be loud enough and noise will drown out the talk. quality of the mono so that it quite useable now. Why not make a Swedish translation for me. 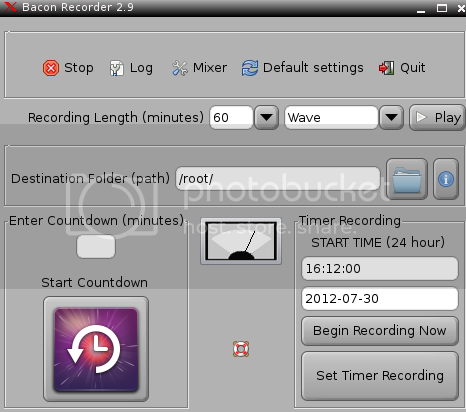 New version of Bacon Recorder 1.4 improves the log feature. begins, so the user can check it now to see if the recording has begun. and two lines more when the recording ends. Yes but that is a way to stop recordings that is nonintuitive. I failed to remember it. I even failed to remember I could look here or write that down on a paper. I recorded some 6 recordings and none of the times I remembered how to shut it down. Sure it is my own fault but intuition tells me there should be a stop button that keeps what one have recorded already even of one shut it down prematurely and does that really happen if one kill it with Pprocess? Would be most handy to have a gentle stop button on the GUI that allowed it to keep the recording but end it at will. 2. *** Is there a simple way to make an Icon to have on the Desktop for to start it ? 3. Would it be difficult to include a feature that had a gate function? It started to record at the time one had set it to but if the sound input was below a trigger level then it waited for the input level to get strong enough and then recorded while the sound lasted and a few seconds below the level of choice and it told time and then waited for next sound and recorded that one and so on. but I am extremely bad at finding swedish words for such tech things. I never talk about them in Swedish so I have no practice knowing what word to use. Being as lonely as I am I have had none to talk with about these things for some 25 years so fail to know what words Swedes would use for it. I am different in that way. 5. Re the low or high impedance? FET Mic usally are rather high. 2.7K or 3.0 K something. I guess I have to go to Acer forum and ask them about the sound card spec of the computer I have. It did exactly what I wanted. Recorded for the time I wanted and when I wanted it to but the signal noise was so bad that it was not usable other than if one had the FET mic some inch from mouth. Even my snoring got drowned in noise. But hopefully that was my fault buying a too insensitive equipment? I have to test with other "recorders" to get something to compare with. And on my other computers. But their Fans are too noisy so sleep will not be good. Thanks. Very nice. Could you please post the source? I want to have a look and also want to recompile for old Puppies, e.g. 3.01, which Dingo and I still use for various purposes, as do quite a few other people . As for killing, I would send it to the tray and have a kill button in a right-click menu. I can implement that if you want. There isn't a 'source' . It's a simple script. a timer. That way it works in all Puppies. Puppies gave strange output to that command. code to me to post? I just type 'killall arecord' and that works perfectly. make it a button in the window??? but if you want to try it be my guest. that a recording is underway. new version 1.5 has a log button . Two lines are written in the log when the recording actually begins. begun. This avoids the awkwardness having to use a text editor. Three more lines are added to log when the recording finishes. I need to understand these things better. You say Change the value . Where does one do that? Some config file? new version 1.6 has a 'Stop' button . recording is already underway it will stop that. The French localization is now finished. I will organize the localization. The work is simple if you want to help me. and I will do the conversion and post it. translation. I will work on the Spanish translation now.